In busy Seattle where homes are scraped for new construction faster than you can believe it, we have listed a vintage farmhouse that really is calling out to be saved & restored. 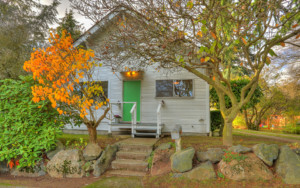 Located in the heart of Crown Hill this little home, 8519 12th Ave NW, is affordable at $439,900 and offers a quiet reprieve from all the hustle & bustle of the city. It sits on a big level lot, oversized by city standards, and has a spacious detached garage. The upstairs is a finished attic that could easily house a third bedroom and the unfinished basement while rough has a ton of space. If you know someone who has wanted to roll up their shirtsleeves and take on a project, this home boasts many of the old world charm features of old Seattle homes. MLS #1048830 for more info, open today until 3:30 and Sunday 1:30 to 3:30. Offers reviewed Thursday Nov. 10th.